Digital (D), Voices: 32, Multi Timbral Capacity: 16 part(s), Oscillators per voice: 2, Production start: 1993, Production ended: Yes. 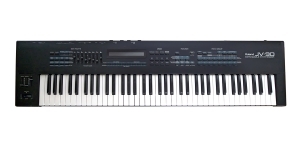 Synthesizer, Performance Synthesizer, Workstation, Digital (D), Voices: 32, Multi Timbral Capacity: 16 part(s), Oscillators per voice: 2, Number of Keys: 61, Size: 5, Aftertouch, Production start: 1993. Synthesizer, Performance Synthesizer, Workstation, Digital (D), Voices: 32, Multi Timbral Capacity: 16 part(s), Oscillators per voice: 2, Number of Keys: 76, Size: 6.5, Aftertouch, Production start: 1993. 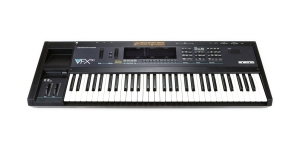 Synthesizer, Performance Synthesizer, Digital (D), Voices: 21, Multi Timbral Capacity: 12 part(s), Oscillators per voice: 6, Aftertouch, Velocity Sensitivity, Number of Keys: 61, Size: 5, Production start: 1989. Workstation, Synthesizer, Digital (D), Voices: 32, Multi Timbral Capacity: 16 part(s), Oscillators per voice: 2, Oscillators overall: 32, Number of Keys: 76, Size: 6, Velocity Sensitivity, Aftertouch. Behringer gets the info leaked. The impressive row of popular synth and drum machine replicas featuring MIDI, USB implementation and Eurorack support is not news yet but it might be a stunning release. Uli catches up with his own production terms and breaks the silence. Pioneer, Sensel and Solid State Logic announce their new products and share some details about the functionality and availability: DJS-1000 stand-alone DJ sampler has been introduced by Pioneer DJ, Sensel Morph adaptable control surface finds its way to the market, Nucleus2 DAW & Studio Controller is going to ship in two versions. Octagon Centre, Sheffield, held the SynthFest UK 2017. Small and big modular manufacturers have shown up luring with new products. Roland, Korg, Moog, AJH Synth, Tasty Chips, Modor, Radikal Technology and others were here to catch your eye while the seminar room was to catch your ear for sure: Radiophonic Workshop shared some stories about Oramics synth machine, surround sound performance. Steve Levine has produced a number of Culture Club’s hits and collected a significant row of synths to boast of. Will Gregory, who’s worked with Tears for Fears, Peter Gabriel and Portishead, joined the VIP Roundtable discussion. Bastl Instruments features the Thyme effects processor, Erica Synths introduces the Erica Black VCF module, Dreadbox Hades ands Elektron Octatrack MkII are shipping. Two new Kickstarter projects launched by Kvgear and KOMA Elektronik. MOK Waverazor: Ready To Purchase! Media Overkill announces the shipping of Waverazor software synthesizer the main feature of which is the actual approach to synthesis which is quite new. The soft is available for both Mac and Windows. The new product is considered to be a futuristic synthesizer splicing waveforms into aggressive sounds. Waverazor was created by MOK founders – the true professionals Rob Rampley, Taiho Yamada and Chris Compton.